A slower week as we all recover from our Thanksgiving hangovers and food-induced comas. Get ready for Krampus. There have been a lot of schmaltzy Christmas movies that have come out over the years. This isn’t one of them. In the tradition of Gremlins and I suppose, Jack Frost, we have a holiday horror film sure to make you wonder what’s coming down that chimney. I’ll admit I’m confused by this flick. At first I thought it would be a hybrid flick in that it would provide a few kiddy scares with a bunch of comedy mixed in. But that wasn’t the vibe I got from the trailer as it looked a lot more scary than I originally considered. This isn’t to say I myself was terrified by the trailer (I swear!) but the amount of things going bump around Christmas Eve night had me wondering who’d actually go see the flick. It looks way too scary for medium-aged kids, and way too corny for adults. That’s a rough middle ground to exist in, and I think the movie suffers because of it. 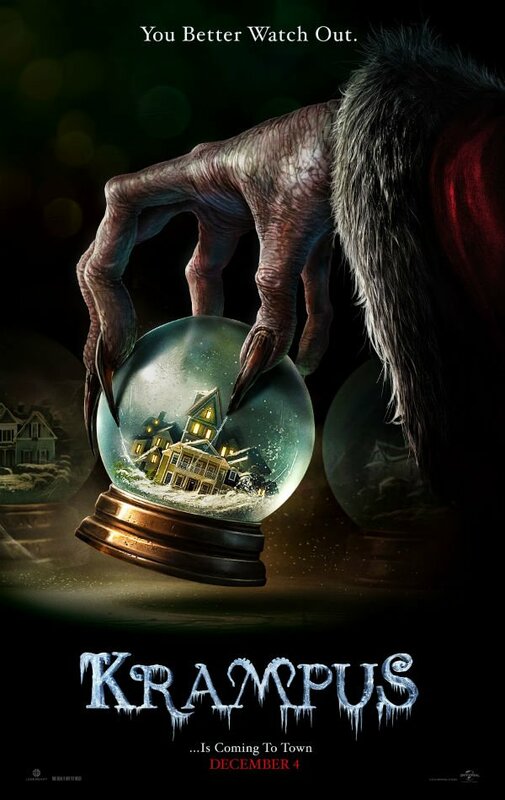 Directed by Michael Dougherty, Krampus tells the story of the titular character, a bizarro Santa Claus, coming to wreak havoc and horror on a family on Christmas Eve. I suppose it’s some kind of commentary on the silliness of the holiday (or it’s just a funny concept) in which kids are terrorized instead of rewarded with presents under the tree. Dougherty’s helmed Trick ‘r Treat (86%) and helped pen Superman Returns (76%) and X2: X-Men United (86%) so he has some wins under his belt. But I don’t think this one follows suit. I have a feeling it rubs many folks the wrong way, and isn’t funny enough to fully distinguish itself as a horror comedy. But if you want to take your kids right out of the Christmas spirit, or looking for an alternative to Elf on the Shelf, then this might be the right flick for you. Do You Think I'm Close With My Krampus Prediction? It should have been a much stronger week for the Rotten Watch in that I had the tenor of all three movies correct, but just missed on some of the scores. I’m feeling good that I pinned down the critical vibe for each one, but only had one of the three predictions land within ten percent. First off, Creed (Predicted: 83% Actual: 93%) ended up as a legit great film in the eyes of the critics. I’m not surprised. Early buzz around the film trended more than positive and we already have a good sense of what Michael B. Jordan can do with serious roles. This kind of buzz for the sixth iteration of a boxing film that started its franchise in the 1970s is unbelievable at worst, triumphant at best. Critics loved it and Sylvester Stallone seems to have proved he can still hang in a dramatic role. Meanwhile, The Good Dinosaur (Predicted: 91% Actual: 77%) finished strong though by Pixar’s standards it doesn’t come close to some of their best. That’s of course rarified air in that the studio has put out a string of nearly perfect films over the years. Many studios would kill for a 77% finish with the critical crowd. To Pixar it probably just becomes "another movie," well down in their canon, but still overall positive. And finally Victor Frankenstein (Predicted: 37% Actual: 23%) finished much worse than expected, and I hadn’t expected much. The film just looked convoluted and oddly-timed. I didn’t understand why we’d so much care about two 19th-century scientists bringing life to a monster. At one point this story made sense, but with technology the way it is at this point, creating Frankenstein is so low stakes compared to something like artifical intelligence running amok. Critics panned it. Next time time around we’re going to get In the Heart of the Sea. It’s gonna be a Rotten Week!